I have found that making a meal plan makes dinner time so much easier. 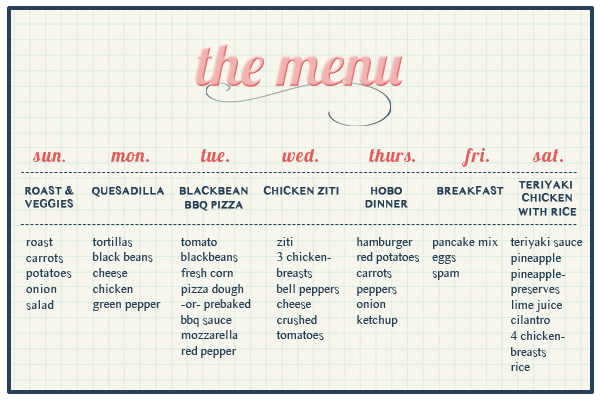 Between the left overs, our once-a-week- desire for freschetta pizza (stocked in out freezer) and the occasional cereal craving for dinner, seven planned dinners will last us two weeks! I am only cooking for two pretty much (the babies eat their own dinner), so if your family is bigger you might have to add in another meal or two. But the jist of this is: PLAN YOUR MEALS! Not only does it save you from the guessing game of What’s For Dinner but it also helps save money. If you already have a meal planned for the evening you will be less tempted to go out to eat which would cost you a whole lot more. Here is my actual menu for this week. I mixed it up, using easy dinners like quesadillas and hobo dinners along with more time consuming ones like chicken ziti and Teriyaki Chicken. And I don’t stick to the meals order, if we feel more like having breakfast for dinner rather than bbq pizza, I’ll just switch it up. It’s such a great method. And I go to the grocery store once every two weeks, buying all the ingredients beforehand! I’ve included links to the recipes that you might not be familiar with because it’s always nice to try a new dish!